LLM Environmental Law is a 1-2 year postgraduate degree in law with an environment as the subject specialization. The colleges offering LLM Environmental Law are conducting the course in full-time mode and distance learning mode as well. The course can be pursued by candidates possessing BA LLB or LLB degree with minimum 45% or 50% marks in aggregate. The admission procedure shall differ for each college but primarily be based on merit or entrance exam conducted by the concerned college. The primary focus of LLM Environment Law is to understand the orientation of legal framework towards sustainable economic activity. While specializing in environmental law students are encouraged to research and explore issues concerning environmental policy, such as global warming, climate change, water waste etc. The course fee is different for each college and may range between INR 23,000 and INR 1,50,000 per year. On successful completion of LLM Environment Law course students can explore job opportunities as Legal Advisor, Advocate, Legal Counsel, Associate (Legal), Assistant Manager (Legal) and Law Officer in various government organizations, law firms, state courts, environmental agencies or academia. The annual average salary that an LLM student gets shall largely depend on his/her first stint. However, working in Environmental Law one can expect anything from INR 15,000 to INR 40,000. Eligibility LLB or BA LLB with minimum 45% or 50% marks in aggregate. LLM Environmental Law: What is it about? LLM Environmental Law course covers local and international legal frameworks for environmental protection, climate change protection and vital use of natural resources. During the programme the students are exposed to many issues like water law, business and trade, different forms of pollution, land issues and environmental justice. Being a specialization in itself, there are no further specializations in Environmental Law and some of the important topics covered include Water (Prevention and Control of Pollution) Act, 1974, Air (Prevention and Control of Pollution) Act, 1981, Environment (Protection) Act,1986, The Forest Act, 1927, Forest (Conservation) Act, 1980, Wildlife (Protection) Act, 1972 as amended in 1991, 2002 and 2006 and Biological Diversity. Students will have the opportunity to intern with environmental agencies, government organizations, and public welfare associations to apply knowledge of environmental law in protecting the environment. An LLM Environmental Law prepares individuals to work as advocates, as educators, as policymakers or as teachers. Candidates seeking admission to the course must obtain a three to five-year LL.B/ BA LLB or Integrated Degree with not less than 50% to 55% marks in aggregate from any university whose degree is recognized by the University Grants Commission. There is relaxation in minimum eligible marks for SC/ST/Persons with Disabilities as well. Generally, colleges/universities running LLM Environmental Law course admit students through Entrance Test conducted at national level or by the college itself. Application forms for these entrance exams are usually invited in the month of April-May. LLM candidates might even get admission directly on the basis of merit as per marks secured in the last qualifying as in case of TNDALU. In the case of Teri SAS University candidates, the final selection is done through personal interview. Environmental Law is increasingly becoming an important specialization in LL.M. as activists, politicians, policymakers and businesses tackle environment issues and how those could be prevented. Successful post graduates work as Legal Advisor, Advocate, Legal Counsel, Associate (Legal), Assistant Manger (Legal), Law Officer or Law Clerks. Lawyers working in firms get benefits like medical insurance and retirement planning and if , lawyer practice independently, then these are not given. 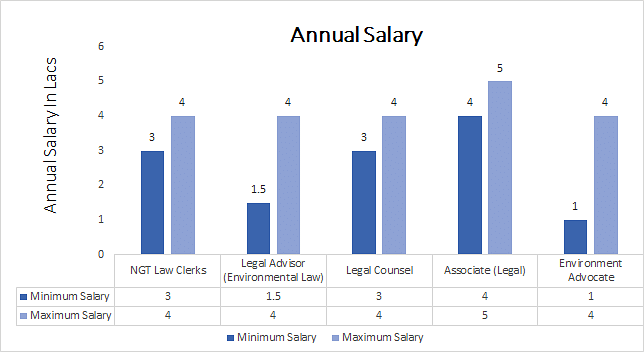 Further, depending on factors such as reputation, expertise, expertise and cases handled a lawyer can earn in Lacs per month. Further, LLM Environmental Law student can plan a career in research and obtain a Ph.D. With good experience in hand, Environment Lawyers can join Central or State Ministries. Likewise they may even prepare for UPSC exams as Lawyers have a good demand as bureaucrats.